I was 9 (I'm pretty sure this was July 1971) and on tour in Sweden with the Finchley Children's Music Group, an excellent children's choir. 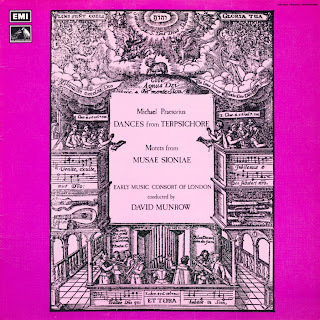 We performed in a church somewhere one afternoon (possibly in ?stersund), and our choirmaster, Richard Andrewe, offered to take anyone who wanted to come along to David Munrow's concert in the same church that evening. that was my first introduction to renaissance music, and my first introduction to David Munrow, a mad, charismatic pixie who captivated his audience (and me) and played amazing music. As soon as I got back to England I got his LP The Medieval Sound and I was hooked for life. I've since been a crumhorn player for a bit (though I've gravitated to percussion in the end), and have developed a lifelong love of all kinds of bagpipes through David's introductions. I almost got to meet David - my father, who did work for the BBC sometimes, was tentatively trying to arrange for me to meet him when we heard about his death. In my list of top 10 happy pieces of music is a piece for chalemeau by David from the Eddie Mercx film. I've often wondered what he might have gone on to achieve. In any case, I'm very grateful for my opportunities to listen to and watch him in action.